Kim Hollis: Audiences flocked to Zombieland this weekend, as it opened to a surprising $24.7 million. How did Sony manage such a strong debut from a film starring mostly unknowns? Tim Briody: The marketing clearly worked and "nut up or shut up" is one of the best taglines of the last few years. I hope the folks involved find something extra in their paychecks this week. Michael Lynderey: It's the same basic strategy as District 9. 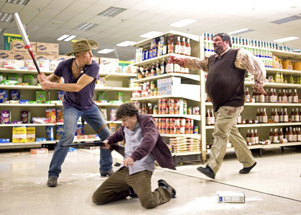 Zombieland didn't look like much on paper, but they "chose" to make a good movie out of it and so the buzz grew in all the right places. It's one of those bi-annual occasions in the horror genre when quality wins out at the box office. As we saw with Drag Me to Hell, good reviews don't necessarily buy you much clout when it comes to horror. Reagen Sulewski: The ad campaign seizing on the film's Rules for surviving the Zombie Apocalypse certainly had a large part of it. There's an unconscious association there that the film has a lot more to show you than what they're giving you in the ads, which could alleviate the kind of "one-joke" fears that people might have had with this. But overall, they were dealing with some quality comic mayhem, and had a pretty easy job to sell this, just needing to push fence-sitters over.